CrossOver, Other Effect Plug-in from rs-met. rs-met has released CrossOver, a new free VST effect plug-in for Windows that replaces rs-met's older Crossover 3-Way plug-in - CrossOver now allows for splitting into up to 4 bands. 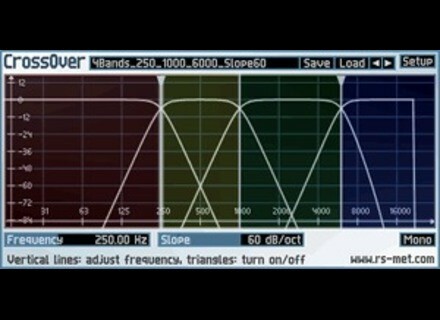 CrossOver is a plug-in to split an incoming signal into several (at most 4) frequency ranges. It can be used to build your own multiband effects within a modular (sub)host environment. 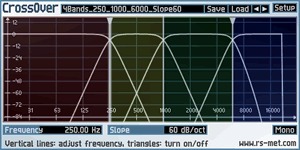 By using only 2 bands, you can also create bass-effects. These are effects which (counterintuitively) keep the low frequency range dry and affect only the high frequency range. The band-splitting is done by complementary pairs of Linkwitz-Riley lowpass/highpass filters, the slope of which is adjustable between 12 and 96 dB/oct. For configurations with more than 2 output bands, the signal is first split into 2 bands (low and high) and then the low or high or both bands is/are split further, thus the splitting is done in a hierarchical manner. Voxengo SPAN 2.0 Voxengo SPAN 2.0 is now available for download - SPAN is a freeware real-time "fast Fourier transform" audio spectrum analyzer plug-in for professional music and audio production applications. Platinum Loops Arabian Breaks Vol. 1 This loop pack contains mixed cuts of music that feature traditional instruments, melodies and rhythms from the Middle East: darbuka drum solos, oud, zither, quabub, buzuk, tabla, dombak, kamanja (Arab fiddle), vocal acrobatics and more. VSL Collections Updates VSL has released updates for the Vienna Instruments, Vienna Imperial and Vienna Suite plug-ins.